Who doesn’t love sizzlers ? 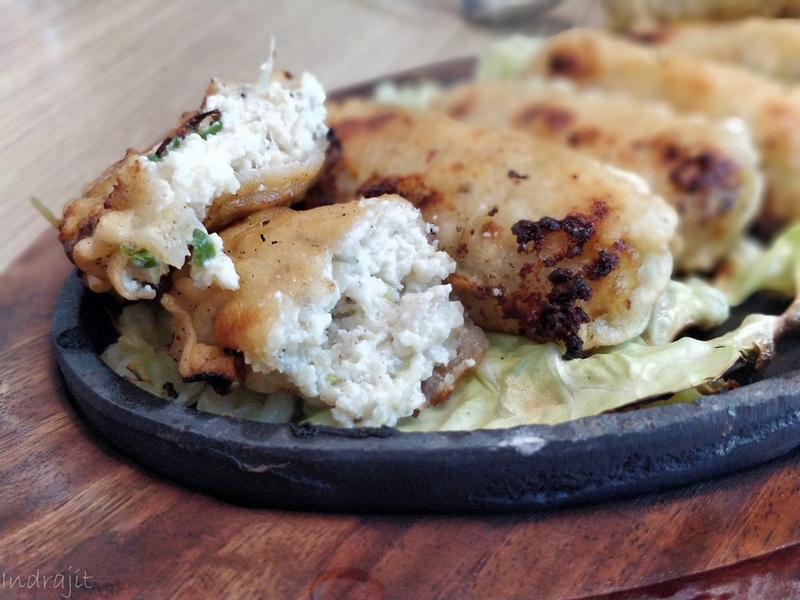 That hissing sound, that sizzling effect and some super hot meat on a rustic , wooden plate- just who doesn’t love them ? 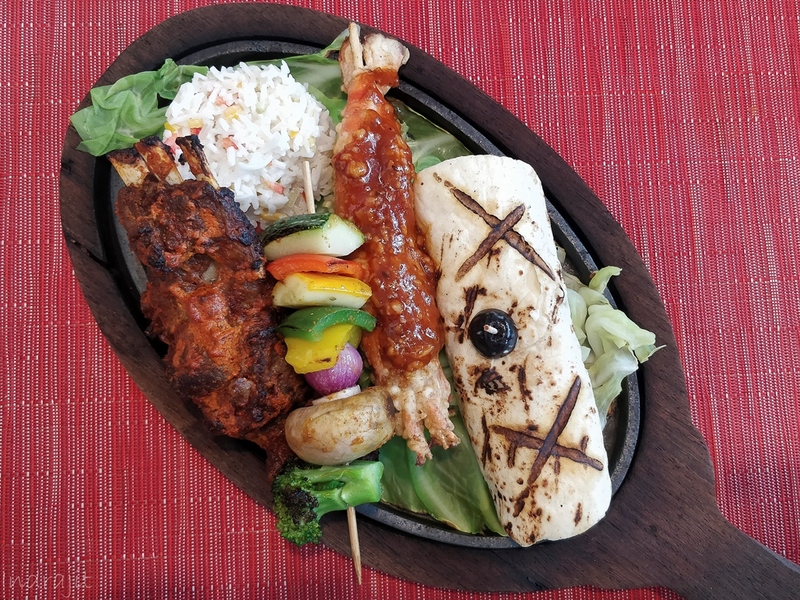 In kolkata, from my childhood, apart from Skyroom as I don’t recall much except for their star-lit ceiling and cold cabbage salad and being a fanboy to my father, Mocambo and Peter Cat always served as our family go-to-place for sizzler. But, apart from the recipe and moreover process, what intrigued me, was the story behind sizzler- how did it start ? Who started it and staff ….. So, here’s what I could gather. 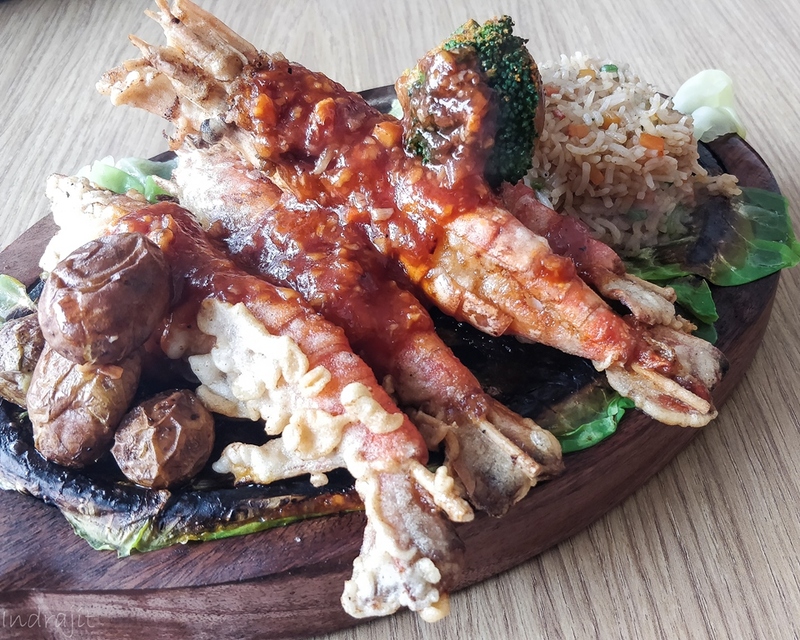 Teppanyaki is a very popular style of cooking followed in Japanese cuisine, where meat and vegetables are cooked on a very, very hot griddle. The whole idea was to keep the outside crunchy and inside moist. After world war II, americans carried this style back home lovingly. 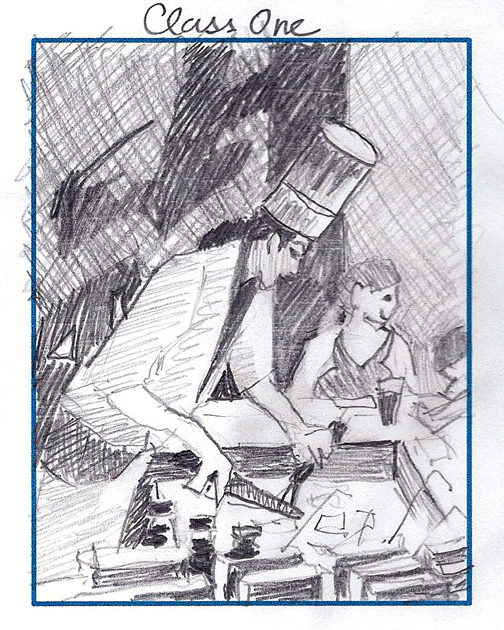 And at 1950’s, a restaurant opened up in California named Sizzlers, where it got popular. As the show-baazi goes, very hot individual service plates were used to create that hissing sound and smoke and people just loved it. 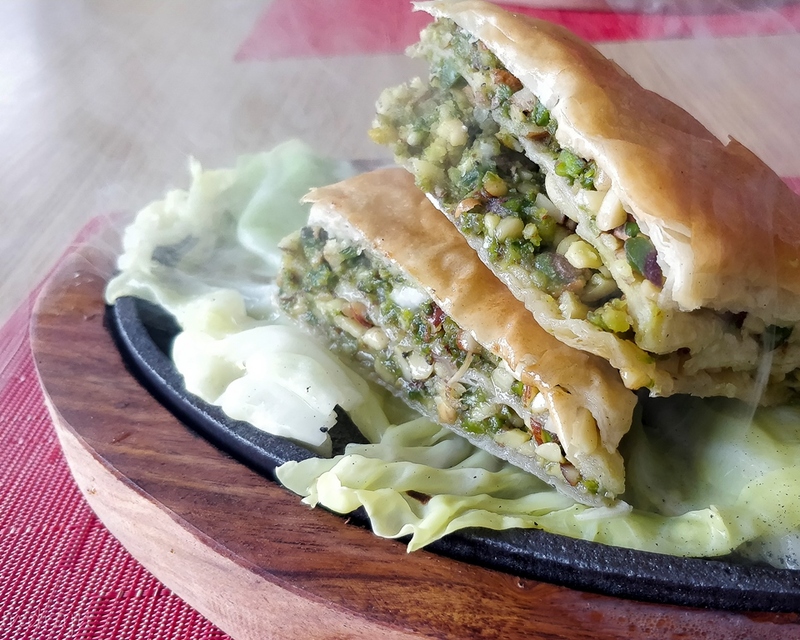 It is then around 1963, a gentleman named Firoz Erani , on his visit to US, saw this- rather loved this and carried it back home to open up a restaurant named The Sizzler in Mumbai. Later on, his son Mr Shahrukh Erani opened up another joint named Touche on 1967 and what I’ve read, both were immensely popular. The famous joints, Kobe Sizzlers and Yoko got their inspiration from them. 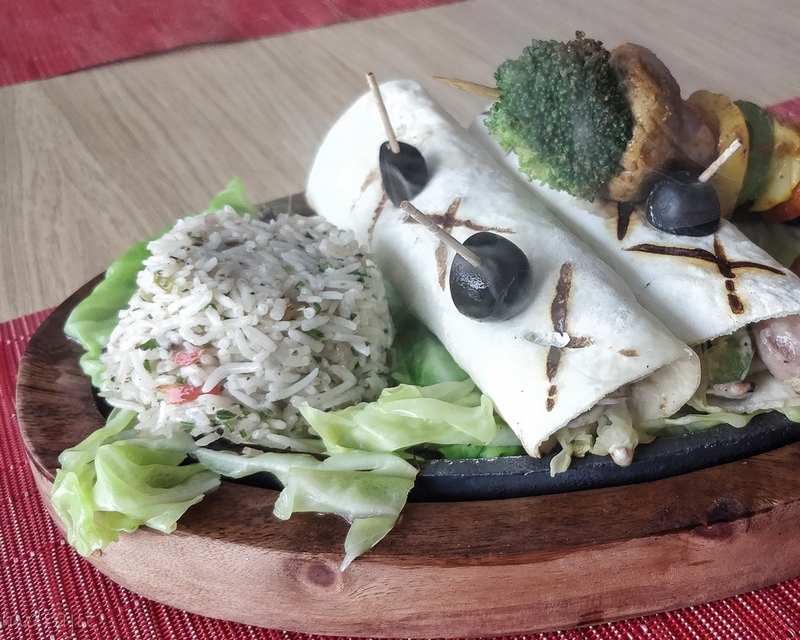 It’s said, Mr Erani moved to Pune to open his third venture The Place Touche, which is said to be pretty popular even today. 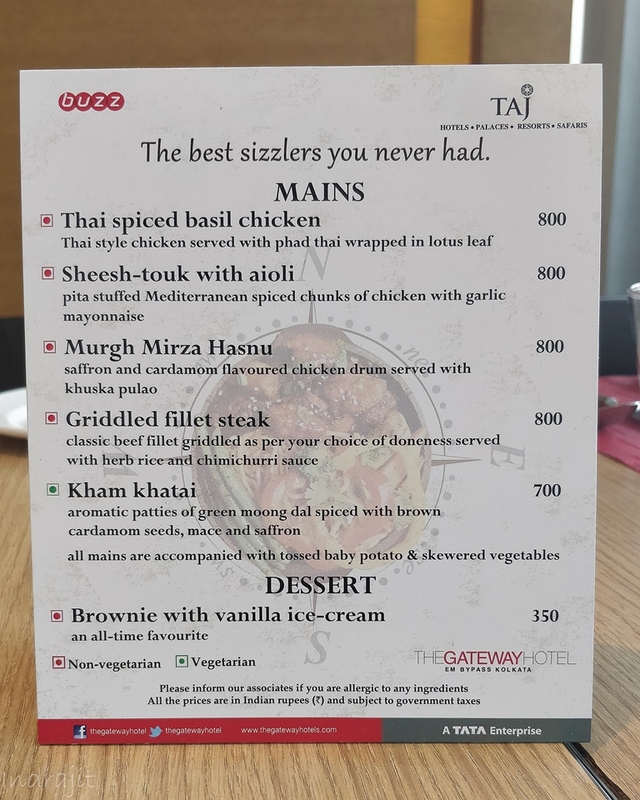 Talking of Sizzlers, recently, i was invited for a tasting session at The Gateway, near Ruby, Kasha and let me narrate my experience here. 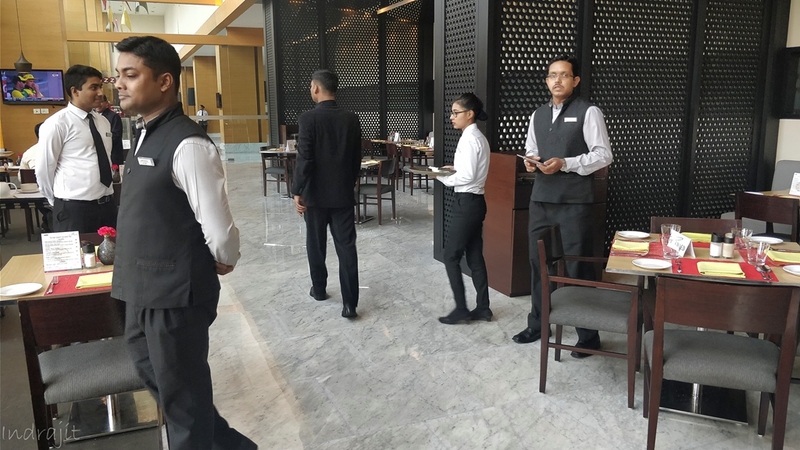 Being a premier property, service is never an issue in The Buzz, Gateway and somehow i feel comfortable with their large glass windows and the flood of sunlight. 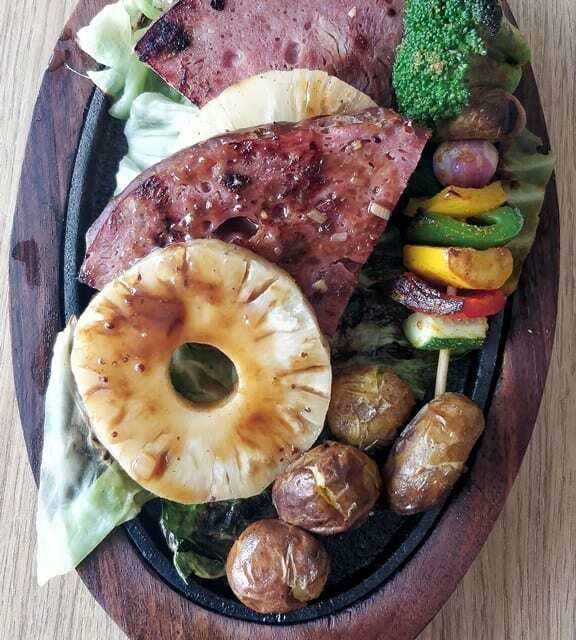 Their Sizzler festival menu is going on till mid February and most of the dishes are priced around 900++ per portion. Portion size is pretty big and is enough for one moderate eater like me. 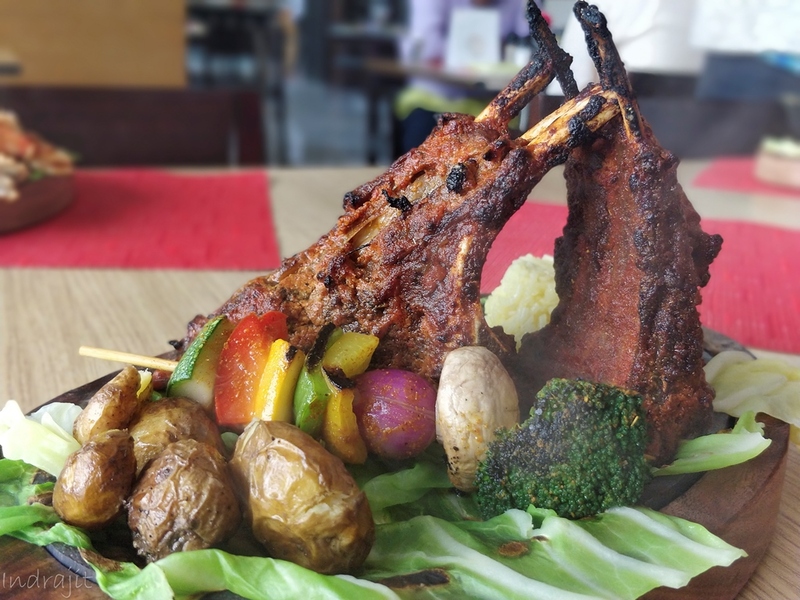 Among the choices given, as I’m a meat lover, my first preference was the Mutton Burrah, finished in sizzler style. Two large pieces were provided with the usual kebab marination and sizzled. Thankfully, the amount of sauce used was very very less and in certain dishes, almost non-existent. Spices were used as the marinade and as a result, the taste of the meat came out. 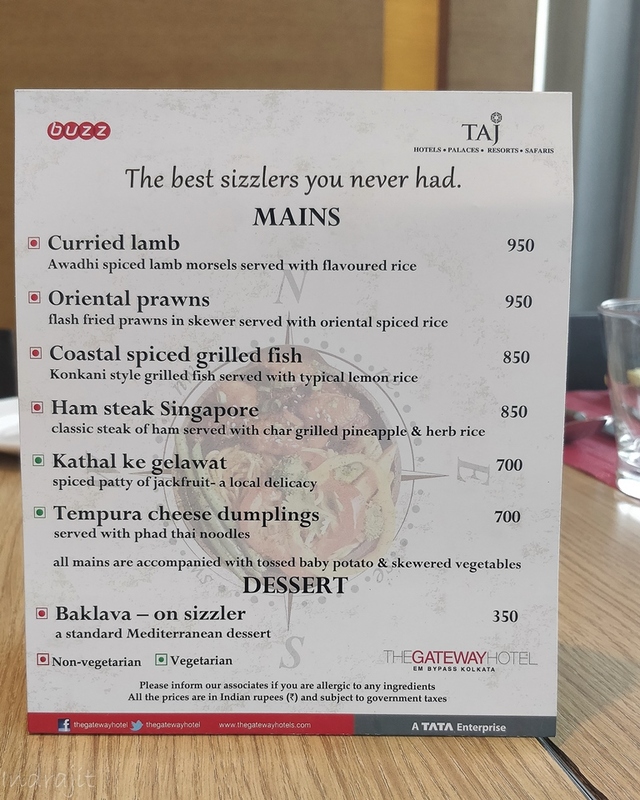 I’m not much of a prawn lover and thought the prawns were quite decent and fresh, The oriental prawn sizzler was okay-ish for me. Rather the sheesh touk with aioli (turkish wrap with chicken chunks) intrigued me. The pita wrap was beautifully done and filling was subtle- kids would love it. But best was yet to come. 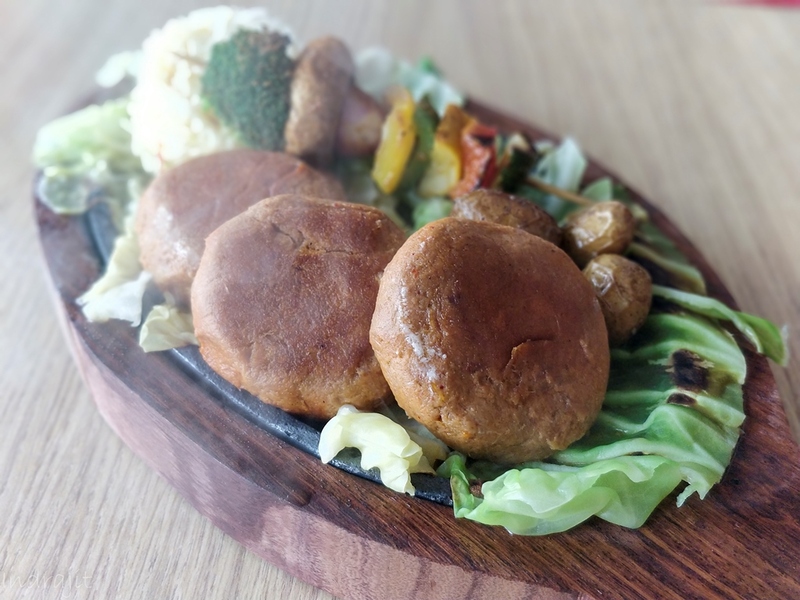 And surprisingly, it was a vegetarian sizzler. The kathal Ke Galawat. The Galawat kebaba were just perfectly shaped, colored and subtly spiced. Yet, they came off when just touched by fork. Another beauty was the Tempura cheese dumpling. The seasoning for the stuffing was done with a dash of lemon and chopped coriander, thus it complemented the otherwise bland tempura cover. These two, though being a carnivore, i can recommend. For dessert, there was Baklava on sizzler. 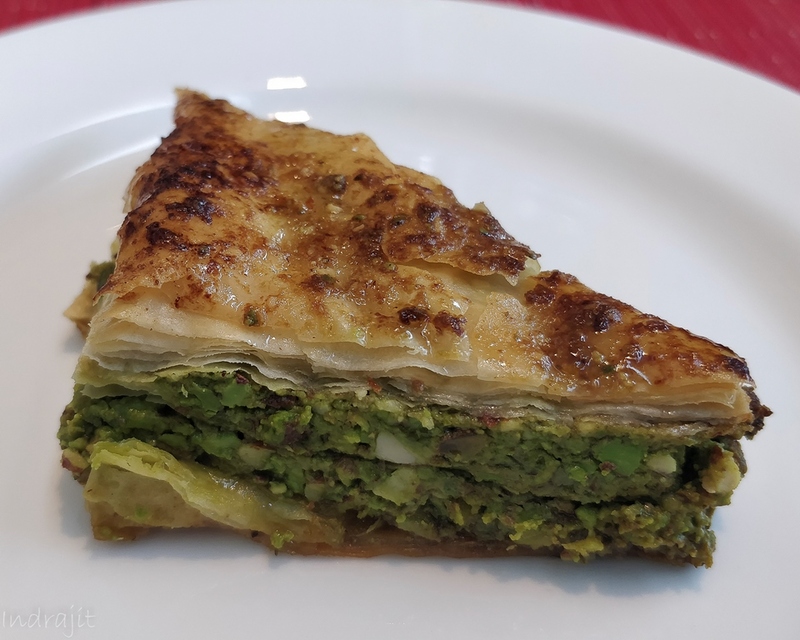 While the Baklava was fine-tune heavily laden with pista and nicely baked , presenting it as sizzler didn’t add any other value than visual pleasure. But this applied to most of the dishes and this is not to demean them. As you can understand, it was impossible to taste all of them individually, so we were served a mixed platter thoughtfully ….. And off course, we went full on with the dessert. Overall, the experience was satisfactory and definitely recommended. So, what’s your sizzler story ?